Gerald Giam delves into the issue of public transport and suggests improvements. The following article was first published in February 2008. We highlight it here again as part of TOC’s Public Transport Week. This paper seeks to highlight problems and provide suggestions for improving the public transport system in Singapore. It is based on the author’s own experiences as a middle-income commuter who relies almost exclusively on public transport, with input received from fellow commuters. In his New Year’s Day message, Prime Minister Lee Hsien Loong announced that a key focus for 2008 for the government is to improve our public transport system, so that more Singaporeans will take buses and trains instead of driving cars. He acknowledged that the government “can do more to make public transport a choice mode of travel”. Among the proposed measures PM Lee highlighted were long-term goals like building more rail lines. However, he pointed out that there are some changes which “can and should be made more quickly” like improving bus services, making transfers more convenient, as well as running more trains at peak hours. This policy focus by the PM is certainly welcome news for the millions of Singaporeans who depend on public transport to get around. In January, Transport Minister Raymond Lim unveiled a series of short and long-term changes to the public transport system, a culmination of the Ministry of Transport’s Land Transport Review. This paper builds upon these proposed changes and offers more recommendations for further improvements. The standard of Singapore‘s public transport system is generally good compared with other major metropolitan areas like Los Angeles and Sydney. However, simply being ‘good’ may not be enough, because of the unique constraints that Singapore faces. It is the government’s stated goal to make public transport a “choice option” and a “viable alternative to the car” . With just 617 sq km on our main island (much of which is set aside for water catchment and SAF training areas), it is untenable for Singapore to have the same proportion of residents driving their own cars as in, say, Los Angeles, which has a much larger land area. Hence, with private cars priced out of the reach of most of the population, they are left with little choice but public transport. It is therefore inappropriate to just benchmark Singapore‘s public transport system against other cities in developed countries. In most of these countries, a car can be purchased for as little as $3,000, making private transport a viable alternative for a much larger percentage of the population. Most Singaporeans enjoy no such luxury. Furthermore, we should not be comparing Singapore with countries that are known to have overcrowded and inferior public transport systems. If there are improvements to be made, Singapore should strive for them rather than look backwards. Category 2: People who may be able to afford a car in the near future. For the Category 1 commuters, who are likely to comprise the bottom 50 per cent of income earners, the government has a moral obligation to ensure that the cost of public transport is kept affordable, and that most parts of the island (especially where workplaces are located) are within reach of the bus and rail networks. Public transport operators SMRT Corporation (SMRT) and SBS Transit (SBST) need to continually explore ways to improve the efficiency of their services, so as to keep their costs and fares affordable for this group of Singaporeans. Category 2 commuters are probably the target of the government’s efforts to make public transport an attractive alternative to cars and cabs. For this group, comfort, convenience and speed are three main factors besides cost that influence their decision whether to take public transport or to drive. Once these people switch to driving, it is very unlikely that they will return to using public transport. 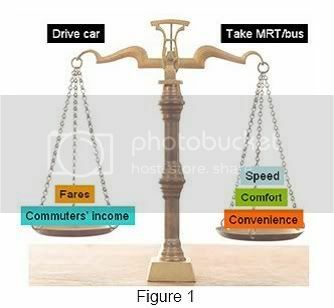 A recent Singapore Press Holdings survey of 295 people who drive cars showed that only two per cent reverted to taking the MRT or buses . With the expected increase of Singapore‘s population to 6.5 million from the current 4.3 million and the growing affluence of the population as a whole, it is imperative that improvements be implemented soon to make public transport a more attractive option than cars. Lower travel costs are usually the only reason for taking public transport instead of driving. Remove the cost factor, and the comfort, convenience and speed offered by cars or taxis make public transport a hands-down lose. The key for the government, therefore, is to ensure that costs of public transport are kept low, while increasing comfort and convenience. As illustrated in Figure 1, as fares and commuters’ income increase, the scale will be tipped in favour of driving. Since fares and income will inevitably increase in the long run, the government and public transport companies need to put in more effort into increasing the comfort and convenience of MRT trains and buses. This paper offers two sets of suggestions on improving the public transport system in Singapore. The first are the “quick wins” — measures which can be implemented quickly and with minimal cost. The second set of suggestions, while not asking for the moon, will require some policy and perhaps mindset changes to implement. Unlike many other major cities I have travelled in, including Tokyo, Singapore‘s MRT is crowded at almost every hour of the day, including late evenings and weekends. It has become a norm to be standing sandwiched between other passengers for the entire ride. Passengers jostle for personal space. Women passengers clutch their handbags closely to their chests to preserve their modesty. At least 20 per cent of standing passengers have nothing to hold on to, as the grab poles are located at the centre of the carriages. Whenever the train comes to a sudden stop, many of them get thrown off balance. The situation is magnified for pregnant mothers, senior citizens and people with disabilities. It is simply not safe, in many cases, for them to board these crowded trains. Is it any wonder that many young Singaporeans will swear to buy a car as soon as they can afford it to escape this madness? During these times, the train frequency is about 2 to 5 minutes. However after “peak hours”, train frequency drops to about 7 to 8 minutes. Disappointingly, SMRT’s “peak hours” do not seem to coincide with the full evening rush hour timings, and curiously neither do they coincide with the taxi peak hour surcharge timings (5 to 8 pm). Busy professionals rarely leave work in time to make it to the MRT station by 6.30 pm. Many (particularly Category 2 commuters) leave work between 6.15 and 7.30 pm. The result is a space crunch as passengers try to get on the trains between 6.30 and 8 pm. Commuters find themselves packed like sardines on both the North-South and East-West lines. Later at night between 10 and 11 pm, especially on weekend nights, this crunch situation is repeated when people head home after an evening out in town. Unfortunately, train frequency is not as high as during peak hours and the trains are often packed to overflowing. SMRT’s 2007 annual report  (see Table 1) revealed that while the number of passenger-trips has increased 10 per cent from 2003 to 2007, the number of car kilometres operated actually decreased by 14 per cent. This explains how average car occupancy increased 23 per cent in that same period. Is it fair for commuters to be paying higher fares yet having to squeeze into much more crowded trains? 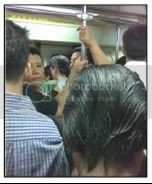 SMRT should be compelled to increase its train frequency and extend its peak hour timings. (T)he current train service frequency is sufficient to meet commuter demand during these time (sic). On the perception of overcrowded trains, we would like to point out that, although our trains are designed with an engineering limit of 1,800 commuters, we rarely carry more than 1,400 commuters per train during peak hours. In fact, the actual typical average passenger load per train is about 1,200. Furthermore, when benchmarked against 15 of the world’s top metro operators from major cities, we are ranked among the top five with one of the lowest density of passengers on our trains. During peak hours, we have an average of four passengers per square metre, as compared to six passengers per square metre for metros located in other densely populated cities. SMRT has admitted that during peak hours, there are up to 233 passengers squeezed in to each carriage, and that peak hour passenger density is 4 passengers per square metre. Based on my experience commuting at peak periods, it appears 6 passengers per square metre would be a more accurate estimate. In any case, even 4 passengers per square metre is too close for comfort. As explained earlier, it is immaterial to benchmark our passenger density against other major cities if we want public transport to be the desired option for most Singaporeans. 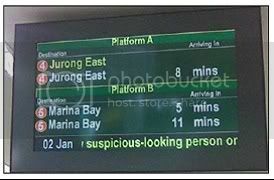 To solve the overcrowding problem, SMRT should extend the evening peak hours to 8 pm every day (even on weekends) and have a higher frequency during the late evening from 10 to 11 pm. During peak hours, the train frequency should be 2 minutes. After peak hours, a frequency of 3 to 5 minutes should be the norm. There is no reason to have train frequency exceeding 6 minutes at any time of the day. I note that it was recently announced that the government will be spending $40 billion by 2020 to extend the rail network, and the Land Transport Authority (LTA) will be working with rail operators to run 93 additional train trips per week from February 2008. These are positive steps in the right direction. The available trip-planning facilities on our public transport network are dismal relative to the level of technological advancement of our country. Although a printed bus guide is available for purchase, it is not convenient to carry around and it is not easy to plan one’s trip using it. SMRT and SBST run their own online bus and MRT guides. However, most people plan their trips based on where they want to go, not which transport company to use. To have to run a web search on both sites is excessively time consuming and confusing. LTA, SMRT and SBS Transit should jointly develop a harmonised online bus and MRT guide with “intelligent” features that help commuters plan the fastest, most convenient way to get from point A to B — be it on the MRT, buses or a combination of both. This online guide should be viewable even on small mobile screens and should be able to accept queries via SMS. In order to ensure the best possible product is built using the most appropriate technology available, the government should fund part of its development costs. In addition, the Singapore Land Authority (SLA) should grant permission for the free use of their road maps in this portal. There is an appalling lack of courtesy and consideration among many commuters. This contributes much of the unpleasantness of taking public transport, especially for less able-bodied people. · Leaning against grab poles, preventing others from holding on to them. Although it is not the core business of public transport operators to teach commuters manners, inculcating a culture of courtesy among commuters could help to make the ride much more enjoyable. Many commuters do not seem to be aware that they are obliged to abide by certain unofficial rules. For example, the sign located above the corner seats on the MRT, “Please give up this seat to someone who needs it more than you,” is ambiguous and comes across as more of a suggestion than a requirement. It is not surprising that many passengers find it perfectly acceptable to fall asleep (or pretend to do so) on those seats and not give up their seats even if a heavily-pregnant woman is standing in front of them. iii. Work with the Ministry of Education in implementing a social graces programme in schools . A list of suggestions on how to do this is in the annex at the end of this article. SMRT and SBST form a duopoly over public transport in Singapore. Not only do they control both the bus and rail networks, they control the taxi fleet as well. The rationale for the government’s decision to privatise public transport was to reduce costs to the government and to promote greater efficiency brought about by market pressures. However, market pressures only work if there is genuine competition. This cannot happen when there are only two players in the market. The recent move by the government to introduce a tendering system for bus routes is sound in principle. However, unless more independent bus operators are allowed to enter the market, the tendering exercises will serve only as window dressing for the same oligopoly. The government’s concern about allowing more entrants is that it would impede its efforts to have an integrated bus and rail network. This can be addressed by establishing a common set of standards that different operators are obliged to adhere to. For example, ezlink card readers should be installed on all buses, regardless of operator, and these readers must be able to calculate transfer fare reductions. With the LTA taking over the centralised planning of public transport routes, it would not take much more effort to plan for more than two bus companies to cover all the necessary routes in Singapore. A similar bidding process should be implemented for MRT lines as well. As there are no other local companies with the expertise to run MRT lines other than SMRT and SBST, foreign operators should be allowed into the market to compete with the incumbents. Ultimately it will be commuters who will benefit from lower fares and better service. The Public Transport Committee (PTC) is seen, rightly or wrongly, by many Singaporeans as a rubber stamp committee which only executes the wishes of the public transport companies. It would be better to appoint to the PTC land transport professionals (e.g., LTA officials) and elected Members of Parliament from the two largest parties in Parliament. This will ensure that the PTC is both cognisant with the technical complexities of public transport, sensitive to the needs of the people and accountable to them. While few will deny that Singapore‘s public transport system is above average compared to most of the world, there is still much room for improvement if we are to achieve the aim of making it an attractive alternative to driving. Transport companies need to pay closer attention to comfort and convenience on public transport, and the government has a responsibility to ensure that there is sufficient competition so as to keep prices affordable. Having an affordable, efficient and comfortable public transport system will increase the quality of life for millions of Singaporeans, while easing the congestion on our roads. Listed in the Annex is a summary of the above-mentioned points as well as further suggestions on how public transport companies can address the problems faced by commuters. · Increase frequency of MRT trains and buses. · Lengthen the peak hour timings. Jerky and uncomfortable rides on buses. · Provide training for bus drivers to start and stop their vehicles more smoothly. Above-ground MRT station platforms hot and uncomfortable during daytime. · Install fans at all outdoor MRT station platforms. · Ensure that soon-to-be-installed platform screen doors allow wind to pass through. · Clearly demarcate seats designated for the elderly or disabled. · Paint these seats a different colour. · Place unambiguous signs at eye level (for seated passengers) instructing — not merely suggesting — that they give up their seats. · Work with schools to organise educational “behind the scenes” tours of the MRT, and teach students the virtue of considerate behaviour from a young age, encouraging them to lead others in following their example. Passengers (esp. teenagers) playing music aloud on the trains and buses. · Have signs indicating that playing music aloud is banned. · This is also implemented in the Tokyo metro. Passengers not allowing others to alight from trains before boarding. Cutting in front of those considerate enough to allow others to alight first. 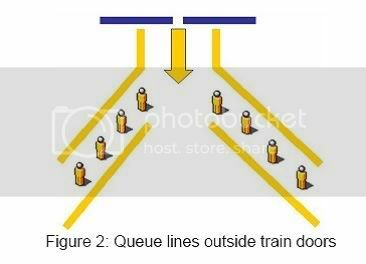 · Paint ‘queue’ lines outside train doors requiring passengers to queue while waiting to board. · The first to arrive gets to board first. · See Figure 2 below. · Tokyo metro stations have these ‘queue’ lines. · Develop a harmonized bus and MRT trip-planning e-portal. · Situate bus stops closer to MRT stations. · Post bus guides at MRT stations so commuters know which bus stop to head to and in which direction. · Introduce genuine competition by allowing more players in the market. · Appoint to the PTC only LTA officials and elected MPs from the Government and Opposition who are accountable to the electorate. High operating costs for SMRT and SBST, leading to increases in fares. · LTA to allow more space for advertising in MRT stations and bus interchanges. · Space on MRT station walls is not being fully utilised for advertising. · SMRT’s “Tunnel TV” is an innovative way to provide more space for advertisers in MRT tunnels. This should be expanded upon.